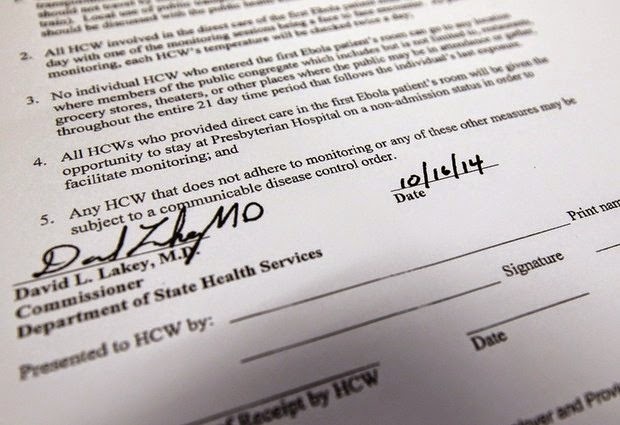 An excerpt from a Texas Department of State Health Services document that healthcare workers with possible exposure to Ebola are being asked to sign. The document is signed by David L. Lakey, M.D. DALLAS, TEXAS (ASSOCIATED PRESS) — The top administrator in Dallas County rushed to Texas Health Presbyterian Hospital this week responding to urgent news: One of its nurses had caught Ebola from a patient. He quickly asked for the hospital's watch list to find out who else might be at risk. "It was explained to me that this person, (nurse) Nina Pham, was not on a monitoring list because she was self-monitoring," said Judge Clay Jenkins, who is overseeing the county's emergency response. Simply put, she and her co-workers, who were handing fluids, inserting IVs and cleaning Thomas Eric Duncan in his dying days, were supposed to take their own temperatures and let someone know if they felt sick. That wasn't nearly enough for Jenkins, and that evening, he began to make changes. Hospital officials told potentially exposed hospital workers to stop seeing patients other than Pham. But the next day, the Centers for Disease Control and Prevention allowed another nurse who cared for Duncan, Amber Vinson, to get on a plane in Ohio and fly to Dallas with a mild fever. She was later diagnosed with Ebola, and CDC Director Tom Frieden has conceded that she "should not have travelled on a commercial airline." Friends and family who had contact with Duncan before he was hospitalized were confined to homes under armed guard, but nurses who handled his contagious bodily fluids were allowed to treat other patients, take mass transit and get on airplanes. The inconsistent response by health officials in monitoring and limiting the movement of health workers has been one of the critical blunders in the Ebola outbreak. "I don't think the directions provided to people at first were as clear as they needed to be, and there have been changes in the instructions given to people over time," said Rep. Michael Burgess, R-Texas, a doctor who did his residency in Dallas. Local health authorities have said repeatedly throughout the response that their guidance and direction can change. "Please keep in mind the contact list is fluid meaning people may fall off the list or new people may be added to the list depending on new information that could arise at any time on any given day," said Dallas County health department spokeswoman Erikka Neroes on Friday when asked how many people are even being monitored. On Thursday, Jenkins announced stricter restrictions that require hospital staffers who had been potentially exposed to stay away from the public for 21 days and check their temperature twice a day, once in person with a public health worker. It was the first written order anyone being monitored has been asked to sign. "They can walk their dog, but they can't go to church; they can't go to schools; they can't go to shopping centers," said Mayor Mike Rawlings. 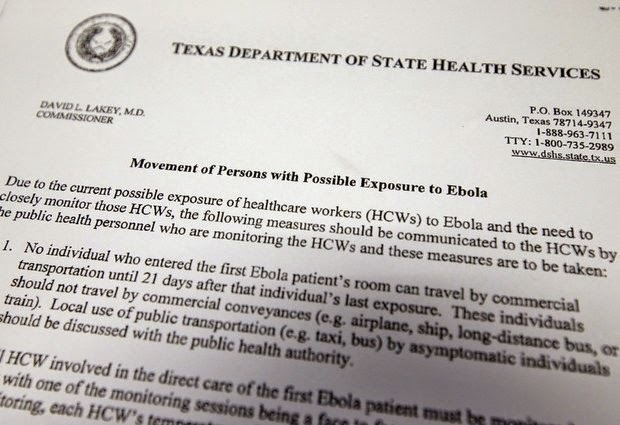 Public health epidemiologists were notifying the health care workers of the directions Friday, said Texas Department of State Health Services spokeswoman Carrie Williams. But even those medical agreements allow some wiggle room. For example, they say public transit isn't outright banned but "should be discussed with the public health authority." Officials say 125 friends, family, doctors, nurses, technicians, ambulance drivers and others may have been exposed in the days before Duncan died on Oct. 8. Since then, the two nurses have tested positive and at least 18 other people in Texas and Ohio have been identified as secondary contacts who also merit watching. At first, the monitoring sounded relatively simple: track down the contacts, monitor them with a least twice daily temperature records and test people who develop symptoms for Ebola. State officials would be in charge, working with the CDC and Dallas County authorities. But different hospital workers had different levels of monitoring, based in part on their exposure risk. Some self-reported some temperatures. Some continued to care for patients. The county moved Duncan's girlfriend, Louise Troh, her 13-year-old son, Duncan's nephew, and a family friend from their apartment to a guarded house in an undisclosed location, where a health official comes by twice a day and takes their temperatures. The unusual confinement order was imposed after the family failed to comply with a request not to leave their apartment, Jenkins said. Pham and Vinson have been taken to medical centers with isolation units in Maryland and Atlanta. There are four such centers in the U.S. At the National Institutes of Health medical center in Bethesda, Maryland, spokeswoman Amanda Fine says staff involved in caring for people with Ebola are given thermometers and instructions and must measure and submit body temperatures twice daily. Taylor Wilson, a spokesman for the Nebraska isolation unit, which has also been treating Ebola patients, said that every time health care workers go into the unit, they must stop and take their temperature and other vital signs and log the results. They are also advised to keep an eye out for any symptoms. He said that there are no restrictions on the staff's movements outside of work. Associated Press writer Emily Schmall contributed to this report from Fort Worth.